THIS IS ONE OF THE GOOD ONES; NO DISAPPOINTMENTS HERE! ALL 5 STAR guest posted REVIEWS! VERY COMPETITIVE PRICING; VERY WELL APPOINTED; VERY NICE VILLA! Aloha! Welcome to Hale 'Ikena Makai, pronounced Ha-lay e-ken-na ma-ki, 'Home with a View of the Sea'. This property is the original member of Platinum Maui Vacations. 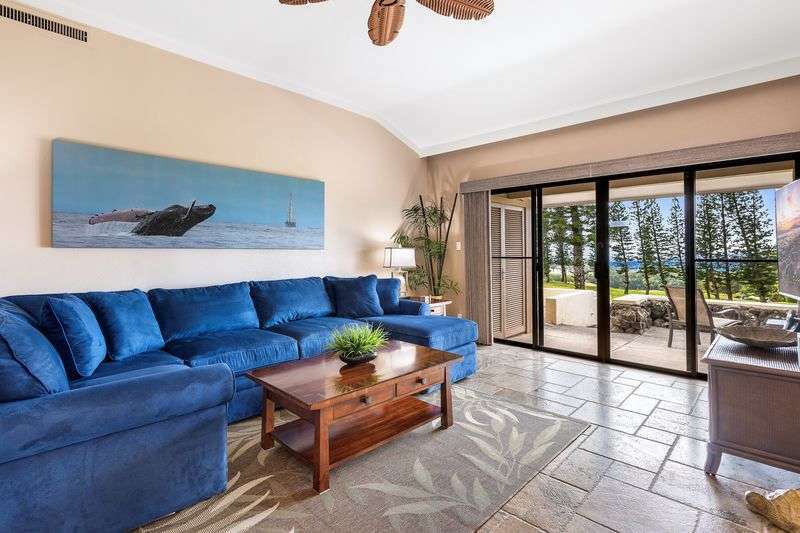 This tastefully remodeled 1 bedroom, 1 1/2 bath Kapalua Golf Villa is a top floor corner unit, up one flight of stairs, all on one level interior, located in building 17 fronting the Kapalua Bay Golf Course on the lower row on the 10th fairway in the prestigious Kapalua Resort. If you like your accommodations to be as upscale, well appointed, unique unto itself, comfortable and affordable, this approximately 900 sq ft villa is truly one that does not disappoint. This upscale resort community overlooking the northwest shore on the island of Maui has 180+ units in the complex built on a west facing hillside with this gem situated on the 10th fairway with no other buildings or rooftops to block the realistic views we portray in this ad. From the first moment you step into Hale ‘Ikena Makai, you will experience the expansive and inviting living area that features comfortable yet classy island style furnishings, a quality 52' wall mounted television, high definition cable, a good sound system, Blue Ray DVD, plus CD, and wireless internet router. As seen in our realistic photography there was no expense spared in the renovation that includes gorgeous and unique granite on the cherry cabinets throughout. The kitchen is well appointed with stainless steel appliances both large and small; if you decide to stay in and cook, everything you need is here. There is a bar area with beverage cooler and plenty of bar glasses highlighted with local art decor. The powder room also with a granite counter top and vessel sink is adjacent to the great room living area. The full bath features custom porcelain tile in the large walk in rain shower, accented by honu or turtle to set off the beautiful granite and vanity with double sinks and custom designs. Both bathrooms feature luxurious cotton towels for your added comfort and convenience. 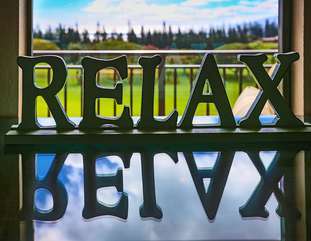 When you’re in Maui, play hard, have fun and then rest up in the spacious bedroom with its comfortable king size bed made up with luxurious clean hotel quality linens. The bedroom also has its own flat screen television for you to enjoy. 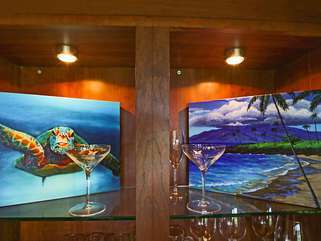 The artworks of Sherri Reeve, Maui’s premiere water colorist, and of Lea Hone Magno, who paints the spirit of aloha in each of her works, sets the tone for your complete relaxation Maui style. 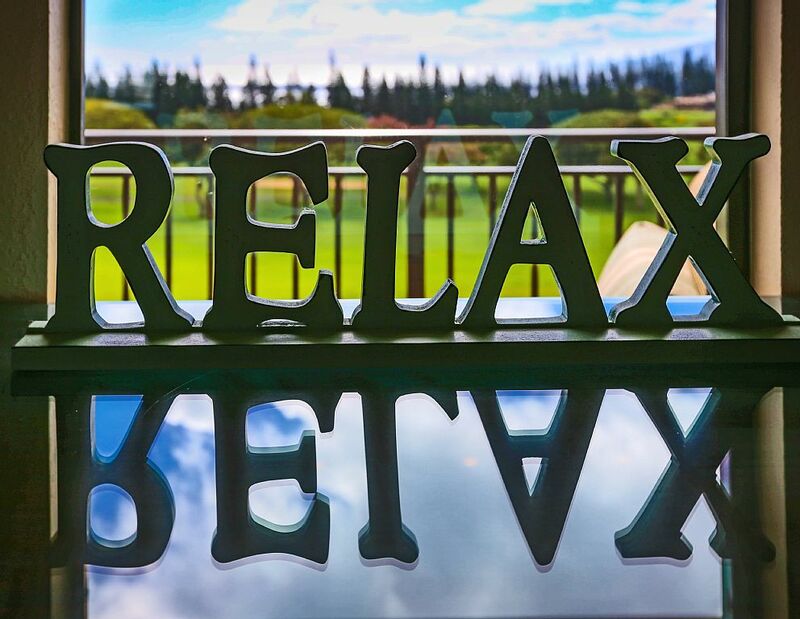 So come on over, relax, rejuvenate, and enjoy yourself at Hale ‘Ikena Makai. ** Please note that a cleaning fee of $175 + tax will be charged for Hale ‘Ikena Makai.